On Second Scoop: Ice Cream Reviews: How long is too long??? Oh the humanity!! That is some nasty freezer burn! It's so bad that part of the sherbetter has condensed and turned several shades lighter, it's near impossible to break through....even with a knife! I dug towards the center hoping to find a few scoops that had remained unscathed, but it's too late....oh my it is too late!! Sometimes I get so excited about new products at the grocery store that unfortunately I do accidentally buy one too many. Had I bought this after we got the new freezer, it would have been downstairs, safe in it's non-auto-defrosting home. 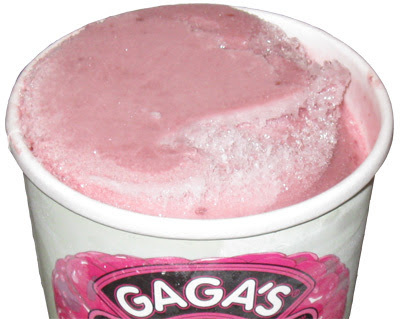 Sorry Gaga's, I'll get a fresh pint as soon as I can.